According to the Academy of Nutrition and Dietetics there will be over 140 educational events and more than 350 companies exhibiting, so, it’s shaping up to be a great conference. 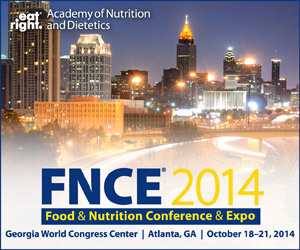 Visit www.eatright.org/fnce for registration and more information. I’ll be in booth 22 under the Kind Dining sign. Are you going? If so, drop me a note in the comments and I’ll look for you.